The author of two preceding Mississippi photography books, Looking Around Mississippi with Walt Grayson and Looking Around Mississippi Some More (named the Mississippi Library Association's 2008 Nonfiction Book of the Year), is back with more photos and more stories from Mississippi. This time, the photographs come from readers of Today in Mississippi. The stories submitted with their photos prompted Walt to pull related tales from his vault of experiences, collected while living in and traveling throughout his home state. If you have any questions please contact Linda Hutcherson at 601-605-8600. 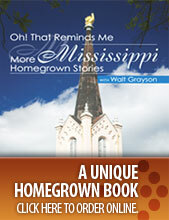 Many bookstores across Mississippi also have the book. Online Order Form When ordering online with a credit card you will receive a receipt via your e-mail address upon completion of the order.